Achebe laments: We’ve lost our Africanism. Achebe’s verdict: Young African writers have done well. To mark the Golden Jubilee anniversary (which begins this weekend) of the publication of the classic - Things Fall Apart – the quartet of Okey Ndibe, Joyce Ashuntantang, Sowore Omoyele, and Oyiza Adaba had a session with the author, Professor Chinua Achebe. It is vintage Achebe, the master story teller himself. Congrats, Professor Achebe, on the 50th commemorative year of Things Fall Apart. Let’s begin with a somewhat predictable question. When Things Fall Apart was published fifty years ago, did you ever suspect that it would travel as much as it has throughout the world? Of course not. There was nothing like it that I knew about. I did not know very much about writing or publishing. There was no plan. It happened, and thinking back now, I can theorize that the story wanted to be told at all costs, and why it chose me to tell the story, I don’t know. It could have been anybody else, the story would have been different, of course, because every person has his or her story. This is my story, and it wanted to be told. It’s remarkable that you should make that point about the story choosing you. On the way here, I was telling Professor Abunaw that Things Fall Apart is the kind of novel one would expect a novelist in his 50s or 60s to write. It’s not the kind of novel you’d expect a young man at 28 to have written—and that’s exactly how she explained it, that the novel must have come to you. It’s intriguing that you speak about this mystical connection, that the story made itself a sort of gift to you. Could you talk about what inspired this novel? Well, what you just said about my age; this is itself part of our story. What colonization did to us was to remove power from the elders and pass it over to children. This is what European education meant for us. I don’t know what other place had this experience of having children, because they went to school, giving them power over the elders to determine what was going to be what. And so that’s part of the reason why it was someone very young. My father could not have written it. There were things, many things that he knew that I didn’t know, but scribbling a story was not one of the things he knew. This is one of the major weapons with which, if you like, we were disorganized, or if you prefer, one of the weapons that enabled us to pick up the fight. The generation that should have done the fight had been disabled. There’s a paradox in the fact that your generation was one of the first to be inducted, as it were, into Western education and Western letters. Part of the drama is that the British who colonized us said that Africans had no story, no history. It was conceivably possible for the colonialists to separate people like you from any form of interest in your history. Instead, what contact with Western ideas did in your case—and in the case of many other African writers—was to engender this hunger, this desire to tell your story. Could you speak to that tension between Europe’s impression that you had no history and your insistence that you had a story and you were going to tell it? Yes, well I’ll tell you another story. James Baldwin and I were invited to speak at an African literature conference somewhere in the South, and what Baldwin said in talking about me to the audience is that “This is a brother I had not seen for 400 years,” and people laughed. And he said that it was not intended that he and I should ever meet. That’s what you asked me. Part of the center of the plan was that we should not know each other. So that’s why our task is, in my view, so very important: that in spite of that intention to keep us apart, there will be some people who would refuse and insist on knowing their brothers and sisters who had been sold away and lost. There are some people who knew that it was important to discover them, and I’m not talking in the past, because the problem remains. There are so many of us on both sides of the Atlantic who do not know the importance of that recognition, that this is my brother, this is my sister, that their story is the same as my story. Whatever variations, it is basically the same story. TFA has become a story in itself, it’s in fact garnered many stories. Could you speak to some of the ways in which the novel has surprised you, some of the stories that it has brought to you since its publication 50 years ago? Well, off the cuff, if you like, one of the first comments I had from children reading it, from students, came from students from a girls’ school in Korea. The whole class of 30 plus wrote a letter each to me and their teacher sent it all. I learned that my story was also the story of Korea, at least as these children saw it. Some of them were very angry that I killed Okonkwo and they thought Okonkwo should have been spared to succeed. They didn’t want him to fail. So that’s one sort of way out…I had never been to Korea, I didn’t know their history, it was these children who told me, “Oh, we were colonized by the Japanese.” And so that similar but different incident of colonization was the thing that held us together. And I’ve discovered that the whole life of the world is full of that kind of similarities and that people can use if they want to make themselves brothers and sisters of other people. I do know that TFA has been translated into more than 50 different languages, so it’s clearly a novel that has resonated around the world. Have you been keeping count, do you know how many languages TFA has been set in now? I also understand that there is an Igbo translation that is in the works; could you speak to that as well? Oh yeah, unfortunately I have not been very well treated by my original British publishers, especially after the first generation—the people I met—after they passed on or left or retired. The new generation came and took over. I remember my publisher, my old publisher, telling me that we had been taken over by accountants, and so relations have not been very good. This has to do with suspicion about how what I was being told, under-accounting, which they have admitted and made efforts to correct. But then you say well, if there was an error in this one that I saw, what about what I have not seen? Can I send an auditor to your place to go through and find out? Oh no, they will not allow this. So I don’t know [how many translations]. I can only say “They told me.” Or “This is what I heard.” The relationship has not been as good as it should be. In spite of the great success of the novel, which you’ve referred to—you, would think that the relation between the writer of that story and those who published it would be very close. Unfortunately, we live in a world of accountants. Could you speak about the Igbo translation? Well, the Igbo translation which you are talking about is probably the one I promised to do (laughter). Well, I understand that there have been translations and so on. So I expect that in the end there will be many translations. But the one I promised to do would be my own version, which I expect would justify itself when it comes out. The book is almost like a mysterious presence, and to be able to take back from English to the original language in which the events happened – the events happened in a language – to do that journey back—because I had sort of taken the story from its roots and created a language, a dialect of English. This was my own invention. This I can now see, because I kept worrying about what word would suit what, I kept worrying about how you translate a proverb so that its dignity would be maintained. I have worried about all those things and now I know why. It’s because I wanted English and Igbo to hold a conversation, and see how you can tell a story that happened in Igbo in this dialect of English. Now I want to go back and do it the other way and see what happens. Again like before I have no idea whether it would work or not. Are you embarked on it, or is it, as it were, on your table of things to do? How long did it take you to actually write TFA? Well, something like two years. Yeah, about two years. And I take it you wrote everything by hand? Did you consider any other titles other than TFA? Oh, I may have, but once I encountered the Yeats’ poem—“Things fall apart, the centre cannot hold;/Mere anarchy is loosed upon the world,”—once I encountered that I knew that was it, I had to take it for the title of Things Fall Apart. It presented itself. How many copies of the original written manuscript did you make, since it took you two years? Did you do two copies, or just one? I did one copy. I made corrections and if I felt a page was too heavily changed, then I would change the page altogether. How much editing did your manuscript receive from you? Do you remember any significant incident that you wrote in and edited out? No, this is 50 years ago. I write very carefully. I wrote very, very carefully, particularly at that beginning of my career. I knew that the language was extremely, extraordinarily important. And if I wrote anything that didn’t quite fit, it told me so immediately. “This wouldn’t work.” You read it and if it’s not so suitable, you keep worrying it until it works. So it’s difficult to answer, you know, the specifics of what exactly did I edit out. But each time I included a word or a sentence or an idea that was contrary to the spirit of the story or to the meaning of the story, [the story] told me itself. I didn’t need an editor. I didn’t really learn anything about form from my teachers. And in a way, that was as it should be, because there was nobody who could have told me how to write Things Fall Apart. It was so peculiar to me. Do you have any remnants at all of the process of writing TFA, any one paper that has survived 50 years, lying somewhere from that period? Oh, there may be. There may be. One thing you must remember is that my history has been quite chaotic, for different reasons. The first chaos was the Biafran War, the civil war—and the coup before it actually. And there is the fact that we abandoned our homes. My ancestral home was destroyed, and now I am not at home, I operate from America. So I don’t know what is there, that’s what I am telling you. I don’t know what is available. It’s possible that someday, somewhere I’ll run into this manuscript that we are looking for. Q: Why did Professor Thomas Melone [a late Cameroonian academic who borrowed the only existing complete manuscript of TFA and never returned it] request the manuscript, and did you know him personally? A: Well he made himself very friendly. He came to see me because he was writing a book, which was about Yeats. And he was a very pleasant man, I must say. He asked me to loan this manuscript to him, and I must say I did not have very much respect for manuscripts then. I really had no sense of it…Once you finish writing something, it’s over. And I also do not like a lot of paper all over me, but now I know the value more than I did then. So anyway I did give this manuscript to Melone and then he just vanished. We were actually in [United] States at the same time, but he wouldn’t reply letters, and so it became clear to me that he wanted to hold on to it for whatever it was worth. Q: If the manuscript were recovered today, where would you want it preserved? A: You know, many of my manuscripts are held at Harvard now, but that’s probably part of my disenchantment with what happened to this manuscript. I think I would say, if it happens let’s look at it at that point—and not to say “Take it here or take it there.” But if I had my way, the manuscript should be in Nigeria. But to do that would be to burn it because people don’t know the value, the facilities would not be provided. So we’ve got a lot of work to do before we can put our house in order. Q: If you had a chance at revising Things Fall Apart, where you would your ax fall? A: I wouldn’t, I wouldn’t bother with revising. A: Well many of you may think whatever you like (general laughter). Yeah, I mean have been told that I was a chauvinist. So people have different readings, but I trust the book, that it has enough spiritual power that it took care of many things that people may not yet understand. So I would leave it exactly as it is. Q: If you were to be a character in TFA, which one would you be? A: There isn’t one that is fully me, because I want everyone to be different there. And so there are parts of me in different people. Perhaps the most moderate one, because moderation is important here. Okonkwo is a man of excess. I respect him as a hero, but a flawed hero. But very interesting, nevertheless; that’s why he is famous. Now, his friend, Obierika, is more moderate, the kind of person who would keep the house in order. And so if I had to be one person, if it’s not Ezinma it probably would be Obierika. Q: One of the most important questions is about the influence of this book in terms of maintaining our culture and our language. Do you find that, as Africans, we are losing our touch with our language and culture? A: Yes, obviously this is one of the major—maybe the top—problems that colonial rule has left for us. So, you have to learn somebody else’s language, and if you wanted to be educated then that was the language you were educated in. That story we know very well. There is no point in going over it now, or in fact weeping over it. I think we should just go to work, find a way to curtail some of the harm that has been done to us, and move on, as Americans would say. Q: What are your views about the African diaspora, the Africans living abroad? Are we living up to our full potential, are we doing what we’re supposed to be doing? A: Well, I referred to this issue earlier on. What we lack is a full understanding of who we are. And until that is absolutely right, until we understand that we are one person, that when we don’t talk about the diaspora, that wherever you find this diaspora, whether it is in America, in Brazil, in Africa itself, wherever—it is the same story that they have. It is the story of the Trans-Atlantic slave trade. So wherever you see an African diaspora person, you know this is a victim, like myself, of that event. Until we realize how thorough and complete it was planned to be—Baldwin said it was never intended that he and I should ever meet, not to talk about discussing anything. So we have a long way to go in the diaspora getting our story straight. If the story is not straight, then we will not be straight. Q: What do you think of today’s writers, the young African writers coming up today? A: Well, they are great, they’re good. There was a time when it seemed as if the thing was drying up. But anybody who knows about art would have known that it was waiting for something to happen. I don’t know what it is, but we seem to be back at work. Q: Do you have any personal favorites? A: Well I wouldn’t mention any, because I would forget my best friends…but since one of them is here, Okey Ndibe is here, that’s a member of this generation. In fact, there are now more than two or three generations since my time. I think this is something that will go on. Q: What does Nigeria mean to you? A: Nigeria is home. First of all, that’s what it means to me: it’s home. It’s a very frustrating home, a very annoying home, but it is my home. And if I had my way, that’s where this interview would be happening. But since it’s not gone that way, you know, I don’t believe in weeping over something. I think it’s more effective, more useful, to find what you can do rather than what you can’t do. So, Nigeria has such a wonderful possibility built into it, but it’s something it never uses. Talent. It would rather use a half-baked person rather than someone who is highly qualified. But that’s the country I’ve got. Q: Any regrets about not receiving the national honors? A: The reason I didn’t receive national honors is that I didn’t want to receive national honors from Nigeria as it was, and perhaps maybe still is today. I was tired of hoping that someone would come up who would understand the value of the position that we’ve earned because of our education, or leadership, or whatever, and to apply it to make our people happier and more prosperous. Q: What kind of legacy would you like to leave behind? How would you like to be remembered? Q: Back to TFA, whose 50th anniversary we are celebrating in 2008. It seems to me that Okonkwo’s problem is also the predicament of his father, Unoka. We’re looking at a lack of balance, a lack of moderation—even though a man like Unoka has great wisdom. Could you speak about the place of balance in Igbo metaphysics, in Igbo understanding of the world? A: Well, it is very, very important. It’s central to our thinking, and I think the Igbo convey it in many different ways. But the one that springs to my mind immediately is the statement that wherever one thing stands, another thing will stand beside it. That’s one thing and another thing, you see. Nothing stands alone. If you see something that stands alone, the Igbo people say “Run away,” because that’s the worst possible danger—this thing that doesn’t have anything near it, not even a necklace to keep it company. By itself: that’s the Igbo idea of evil. Alone, you see. So, it’s from there that the idea of balance comes. One thing is good but something else is also good. It says: become familiar with your home, but know also about your neighbors. The young man who never went anywhere thinks his mother is the greatest cook. That’s one thing they tell us. So balance is at the center of our idea of the good life; the good world is a world in which there are many kinds. Q: The other thing is: you’ve been accused by some critics of harboring an unflattering view of women in your novels. But to go back to again the concept of balance, reading through TFA one sees the concept of spaces. We have male crop and female crop, male functions and female functions, ceremonies that are exclusive to women as well as ceremonies that are exclusive to men. And so it seems to me that there is a very intricate sense of balance in those arrangements. How do you see the place of women within the society you depict? A: There is a misreading of my fiction in that complaint. I think many people think that what I’m doing is praising the position of women. It’s not; in fact, it’s very opposite. What I was doing was pointing out how unjust the Igbo society is to women. And how better to explore it than to make the hero of this story, Okonkwo…all his problems are problems to do with the feminine. There’s nothing else wrong with Okonkwo except his failure to understand that the gentleness, the compassion that we associate with women is even more important than strength. Now, people don’t understand why I am showing these women who are not in charge. I’m showing them that way because that’s how it is in this society I want to change. And that’s what Okonkwo was not able to learn, and I want others after him to learn it: that women, compassion, music…these things are as valuable—more valuable—than war and violence. Q: One of the ironies is that Okonkwo the warrior misses out on two points. One is that the most important deity in this society, the earth goddess, is a female goddess. The other is that Agbala, the Oracle of the Hills and Caves which has supervisory powers over wars again has a female principle at its core. Okonkwo, who is an extraordinary warrior, doesn’t get that particular point and so continues to live under the illusion that the only thing that is important is the male and masculinity. Could you then talk about Unoka’s importance in TFA? A: Well Unoka, if you like, you like you can place him with the women in the society. This is how Okonkwo saw him. But he’s a very decent and nice person. Not successful in the sense of wealth and resources, or ability to look after his family and live big. All these things didn’t work for him. One thing that worked for him was his flute, so in the view of the Igbo people he was a failure. And this is in fact where Okonkwo makes his biggest mistake, and Igbo culture is partly responsible because Igbo culture makes a lot of strength and power and success—and Okonkwo heard this from his society. He heard it all the time, you know, this importance of strength and being manly and so on. Now Igbo society does not talk so loudly about the other side, but it talks gently. It’s there, but you’ve got to make an effort to listen to hear it. If you are wearing all these heavy things people wear in their ears nowadays, you probably won’t hear it. But in a gentle voice the society is saying, “But also remember your children, but also remember the women, but also remember compassion.” Why does it say, “Well if the gods have decided that this boy (Ikemefuna] should die, we can’t stop them but I won’t be there”? So cowardice is even a value. The Igbo society is saying that to Okonkwo. It is not only in the machete that there is virtue. There is virtue in sitting down quietly and contemplating. Q: Unoka is something of a poet in a sense, certainly in his use of language. He is also a dramatist in the way he dismisses Okoye, his creditor. And there is something of a philosopher in him as well. In a sense, you’ve created an artist figure in him, a man who in a different time and society would sit down and write witty and interesting books—and be successful. But he lived in a society that required that, in addition to being a good artist, being good at your flute and music, you must also be a good farmer and brave warrior. Did you deliberately want Unoka to be that artist figure within this society, maybe a wise man, but wise in his own wretched way? A: Obviously, yes. I mean that’s why he’s there, I guess. The way I write is not to say, “Okay, where is an artist figure to put in here?” The story dictates all that. Even what we call it, which is a way of defining in a precise way what is perhaps loose and vague and so on, about a character—all that is part of your story, your story-making. And I think one learns how to include them without even talking about them as if they were abstractions. This is what you find in a complete life, the life of a society that is truly alive. Q: TFA has become the most widely read, most widely translated novel in African literature. Have you reflected at all on the impact that TFA specifically but also your total oeuvre have had on other African writers? A: Yes. I haven’t given much thought in the sense of writing anything about it. For one thing, it’s a little risky, you know. Some people started talking about the Achebe generation. It’s not everybody who wants to be in the school of Achebe. Some of my best friends became writers. I’m thinking particularly, for instance, now of John Munonye, who was my classmate. Now there’s a joke that was told me by another friend, Francis Ellah—about himself and John Munonye. Francis said they thought, after the publication of TFA, “Why can’t we be writing a novel, be novelists?” So they decided they were going to begin. So they bought lots of pencils and paper and they were to begin this weekend. And so John went into one room, Francis to the other, and they started writing. The way Francis put it, probably not exactly, was that by the end of the day he gave up and John continued. A: So it wasn’t even the younger generation. These were people of my own age. And many of them, quite a number, did take up writing, but of course they would write differently. And by the way, the generation of Cyprian Ekwensi was then the background, the older generation than ourselves. He had followed a different path in writing, but he was there. So it wasn’t altogether an accident. Amos Tutuola was there; again a different path. Some pundits said, “Oh that’s how African literature will be,” but no single person has ever copied Tutuola because there is just no way you can get it. That is his own. So we are lucky. There is really talent in our culture, a lot of talent, and it’s not an accident that Nigeria, in the past, has all these traditions – the Nok culture, the Igbo-Ukwu culture, the Ife culture, the Benin culture and all of them very rich. And all we need is to sit down quietly and make something of it. Q: TFA and Okonkwo have been with us for 50 years. Has Okonkwo been living with you these 50 years, has he been with you, and how is he doing? A: Yeah, it’s interesting how you put it. He has, and what I feel towards him is a sense of wonder and pity. Pity is probably not a good word because Okonkwo is a very dignified and proud person and would not like anyone to pity him. But I am sort of concerned that a major aspect of our human experience has to be suffering and failing to reach where you set out to go because of all kinds of things on the way. One day somebody came to me in the hospital after I had this accident, and the question he asked me was, “Why you? Why would this happen to you?” So I said—I didn’t think twice—I said to him, “Do you have an idea of somebody else to whom it should have happened?” What I was saying is that the world is tragic by nature. And that’s why tragic stories appeal to me, far more than happy and comic stories. Both the tragic and the comic are there in our lives, but somehow the tragic one, the Okonkwo kind of story, is the one that speaks most to us. Q: You’ve made a personal effort to make sure we don’t forget the late poet, Christopher Okigbo, who was your close friend. Does Okigbo live on because of your efforts or because he left behind works that still speak to us? A: My son was two years or three years old when Okigbo died, and when I came back – this is during the Biafran war – I just traveled from Enugu to my home to announce to my family that I heard on the radio that Okigbo had been killed. My son, Ike, said, “Daddy, don’t let him die!” The reason was that Okigbo had made friends with him. Okigbo had friends everywhere, children, old people. I remember that whenever he came to visit us, this little boy would hold his hand and try to break it and Okigbo would be pretending to be in pain crying. They would be struggling this way and Okigbo would say over his head, “Children are so wicked.” And so that’s the boy who said, “Don’t let him die.” I then decided to publish something called Don’t Let Him Die, an anthology of poetry by friends of Okigbo—or anyone who wanted to contribute. There was no plan which would work unless the subject, in this case Okigbo, had something of interest to say. His life was so romantic in a way, his life and death was so extraordinary. It just seemed so unlike anybody else you knew. So that’s the material for the kind of history that we have of him. But there is also the profound nature of his poetry. So it is both his life and his works. Q: There’s the moment in TFA when the District Commissioner says the story of Okonkwo is interesting, but he wants to give it perhaps a paragraph in his own book. Did you consciously write that as irony…? A: Yeah, I think so. I mean it’s clearly…it’s not very fine irony, it’s so crude. Q: You think it’s crude? A: Yeah, for the man who said it. But that’s how they figured out the colonial subject. Q: I read your bio and you were a very savvy young man, the way they described you in those days in the 70s, the way you dressed, and all that. When I heard of this accident, it’s been worrying me, and I’m sure it’s worried a lot of your fans: What exactly has this accident meant to you as a writer and person? Do you think you could have produced more than you’ve done…? A: Well, it’s done those things you’ve just indicated. I was telling you the story of the fellow who said, Why should it happen to me? And my answer is “Why not?” And that’s really what I believe. Look at my fiction. Okonkwo is strong-headed, and wouldn’t listen to advice, and it’s a trap. And what happens? He comes to a sticky end. Then I say, okay, let me try a different kind of African, an intellectual kind of person. So I go to Ezeulu in Arrow of God. He is a priest, a philosopher, and what happens to him? He comes to a sticky end. So there’s no way out. What came to us—in Igbo they say that what came to Nte—Nte is a small insect—the Igbo say that what came to it is bigger than it. What was caught in his trap – Nte went and set a trap – and something bigger than himself was caught in that trap. So what does Nte do? So there is no way, there is no short answer to the problem posed to us from the moment the initiative was taken from us and we lost our freedom and independence. Q: How can literature illuminate the African—even human—crisis? A: Oh, there were people who had a very, very rough treatment in the world. They are known as black people. And they were fighting or struggling to make sense of what happened to them. Someone said to them, “Why should this happen to you, why you?” And they said, “Well, that’s the way the world is.” We must find a way out, we must face this problem, face our history. When a people have a history that is embittered—Anthills of the Savannah—an embittered history, we’ve got a task on our hands. We’ve got a big task. And even Nigeria, impossible as it seems, we’ll someday get under control. We won’t keep having retired generals and so on much longer. The thing is not to lose hope. Despair is the worst possible suggestion. I think we must struggle and keep fighting. Q: Over the next fifty years, will TFA continue to speak to us about this struggle? A: Well if it does—I mean if you find it useful, but it’s not because I said so—it is simply that people found that it was speaking to them. If it stops speaking to people then people will stop reading it. Q: When you were writing TFA, which was the day you felt, yes, this was a book and I trust it? A: Well, I think it was the day I finished. But you see, the thing with writing, my kind of writing, is that you never really finish. When I thought I had finished, Bisi Onabanjo, with whom I was sharing accommodation in London—we both went to the BBC—and a friend—he knew I had this manuscript, and he said to me, “Why don’t you show it to this?” The man was a BBC producer who was a novelist, Gilbert Phelps. I was very shy, but Bisi kept saying, “Show him.” So after a while I took this manuscript and I told him I was writing. And he looked as writers look if you bring them a manuscript. He wasn’t hostile, but he wasn’t exactly impressive. But he accepted—very polite. Then Bisi and I, we went on some British Council tour of three or four days. One day I came back from an outing and there was a message for me that said one Gilbert Phelps called and left his number. So I said, well, if he doesn’t like the book, would he make a phone call? Wouldn’t he wait for me to return? So maybe he likes it. So I would call him. That was the first response I had—and to cut a long story short, he liked the book. He recommended his publishers to see it. Meanwhile, his publishers saw it and they were ready to start. I said, “No, the book is not ready.” I had made a mistake in thinking that I could have three generations in one book. And yet it’s not a big book. So it is too thin to carry this weight. That version of TFA had Okonkwo, Okonkwo’s children’s generation, and a third generation—so bringing it to today. And now I realized just so suddenly that there are three books. The first part is Okonkwo. So that’s what I’m going to do. And then after that I’ll see what happens. And so I rewrote the book with this emphasis on Okonkwo’s generation, not his son. Eventually I wrote No Longer At Ease, the story of Okonkwo’s son. But what about my father’s generation? That one is still waiting to be done. So, see, there is no quick answer to your question. If it’s working, go on. If it’s not, then try something else. Q: Of all your books, which one got you into the most struggle? Why did Professor Thomas Melone [a late Cameroonian academic who borrowed the only existing complete manuscript of TFA and never returned it] request the manuscript, and did you know him personally? Well he made himself very friendly. He came to see me because he was writing a book, which was about Yeats. And he was a very pleasant man, I must say. He asked me to loan this manuscript to him, and I must say I did not have very much respect for manuscripts then. I really had no sense of it…Once you finish writing something, it’s over. And I also do not like a lot of paper all over me, but now I know the value more than I did then. So anyway I did give this manuscript to Melone and then he just vanished. We were actually in [United] States at the same time, but he wouldn’t reply letters, and so it became clear to me that he wanted to hold on to it for whatever it was worth. If the manuscript were recovered today, where would you want it preserved? You know, many of my manuscripts are held at Harvard now, but that’s probably part of my disenchantment with what happened to this manuscript. I think I would say, if it happens let’s look at it at that point—and not to say “Take it here or take it there.” But if I had my way, the manuscript should be in Nigeria. But to do that would be to burn it because people don’t know the value, the facilities would not be provided. So we’ve got a lot of work to do before we can put our house in order. If you had a chance at revising Things Fall Apart, where you would your ax fall? I wouldn’t, I wouldn’t bother with revising. Not even the incident with Chielo that some of us think that maybe… Well many of you may think whatever you like (general laughter). Yeah, I mean have been told that I was a chauvinist. So people have different readings, but I trust the book, that it has enough spiritual power that it took care of many things that people may not yet understand. So I would leave it exactly as it is. If you were to be a character in TFA, which one would you be? There isn’t one that is fully me, because I want everyone to be different there. And so there are parts of me in different people. Perhaps the most moderate one, because moderation is important here. Okonkwo is a man of excess. I respect him as a hero, but a flawed hero. But very interesting, nevertheless; that’s why he is famous. Now, his friend, Obierika, is more moderate, the kind of person who would keep the house in order. And so if I had to be one person, if it’s not Ezinma it probably would be Obierika. One of the most important questions is about the influence of this book in terms of maintaining our culture and our language. Do you find that, as Africans, we are losing our touch with our language and culture? Yes, obviously this is one of the major—maybe the top—problems that colonial rule has left for us. So, you have to learn somebody else’s language, and if you wanted to be educated then that was the language you were educated in. That story we know very well. There is no point in going over it now, or in fact weeping over it. I think we should just go to work, find a way to curtail some of the harm that has been done to us, and move on, as Americans would say. What are your views about the African diaspora, the Africans living abroad? Are we living up to our full potential, are we doing what we’re supposed to be doing? Well, I referred to this issue earlier on. What we lack is a full understanding of who we are. And until that is absolutely right, until we understand that we are one person, that when we don’t talk about the diaspora, that wherever you find this diaspora, whether it is in America, in Brazil, in Africa itself, wherever it is the same story that they have. It is the story of the Trans-Atlantic slave trade. So wherever you see an African diaspora person, you know this is a victim, like myself, of that event. Until we realize how thorough and complete it was planned to be. Baldwin said it was never intended that he and I should ever meet, not to talk about discussing anything. So we have a long way to go in the diaspora getting our story straight. If the story is not straight, then we will not be straight. What do you think of today’s writers, the young African writers coming up today? Well, they are great, they’re good. There was a time when it seemed as if the thing was drying up. But anybody who knows about art would have known that it was waiting for something to happen. I don’t know what it is, but we seem to be back at work. Well I wouldn’t mention any, because I would forget my best friends…but since one of them is here, Okey Ndibe is here, that’s a member of this generation. In fact, there are now more than two or three generations since my time. I think this is something that will go on. Nigeria is home. First of all, that’s what it means to me: it’s home. It’s a very frustrating home, a very annoying home, but it is my home. And if I had my way, that’s where this interview would be happening. But since it’s not gone that way, you know, I don’t believe in weeping over something. I think it’s more effective, more useful, to find what you can do rather than what you can’t do. So, Nigeria has such a wonderful possibility built into it, but it’s something it never uses. Talent. It would rather use a half-baked person rather than someone who is highly qualified. But that’s the country I’ve got. Any regrets about not receiving the national honors? The reason I didn’t receive national honors is that I didn’t want to receive national honors from Nigeria as it was, and perhaps maybe still is today. I was tired of hoping that someone would come up who would understand the value of the position that we’ve earned because of our education, or leadership, or whatever, and to apply it to make our people happier and more prosperous. What kind of legacy would you like to leave behind? How would you like to be remembered? Oh, just a nice guy. (Everyone laughs) Back to TFA, whose 50th anniversary we are celebrating in 2008. It seems to me that Okonkwo’s problem is also the predicament of his father, Unoka. We’re looking at a lack of balance, a lack of moderation—even though a man like Unoka has great wisdom. Could you speak about the place of balance in Igbo metaphysics, in Igbo understanding of the world? Well, it is very, very important. It’s central to our thinking, and I think the Igbo convey it in many different ways. But the one that springs to my mind immediately is the statement that wherever one thing stands, another thing will stand beside it. That’s one thing and another thing, you see. Nothing stands alone. If you see something that stands alone, the Igbo people say “Run away,” because that’s the worst possible danger—this thing that doesn’t have anything near it, not even a necklace to keep it company. By itself: that’s the Igbo idea of evil. Alone, you see. So, it’s from there that the idea of balance comes. One thing is good but something else is also good. It says: become familiar with your home, but know also about your neighbors. The young man who never went anywhere thinks his mother is the greatest cook. That’s one thing they tell us. So balance is at the center of our idea of the good life; the good world is a world in which there are many kinds. The other thing is: you’ve been accused by some critics of harboring an unflattering view of women in your novels. But to go back to again the concept of balance, reading through TFA one sees the concept of spaces. We have male crop and female crop, male functions and female functions, ceremonies that are exclusive to women as well as ceremonies that are exclusive to men. And so it seems to me that there is a very intricate sense of balance in those arrangements. How do you see the place of women within the society you depict? There is a misreading of my fiction in that complaint. I think many people think that what I’m doing is praising the position of women. It’s not; in fact, it’s very opposite. What I was doing was pointing out how unjust the Igbo society is to women. And how better to explore it than to make the hero of this story, Okonkwo…all his problems are problems to do with the feminine. There’s nothing else wrong with Okonkwo except his failure to understand that the gentleness, the compassion that we associate with women is even more important than strength. Now, people don’t understand why I am showing these women who are not in charge. I’m showing them that way because that’s how it is in this society I want to change. And that’s what Okonkwo was not able to learn, and I want others after him to learn it: that women, compassion, music…these things are as valuable—more valuable—than war and violence. One of the ironies is that Okonkwo the warrior misses out on two points. One is that the most important deity in this society, the earth goddess, is a female goddess. The other is that Agbala, the Oracle of the Hills and Caves which has supervisory powers over wars again has a female principle at its core. Okonkwo, who is an extraordinary warrior, doesn’t get that particular point and so continues to live under the illusion that the only thing that is important is the male and masculinity. Could you then talk about Unoka’s importance in TFA? Well Unoka, if you like, you like you can place him with the women in the society. This is how Okonkwo saw him. But he’s a very decent and nice person. Not successful in the sense of wealth and resources, or ability to look after his family and live big. All these things didn’t work for him. One thing that worked for him was his flute, so in the view of the Igbo people he was a failure. And this is in fact where Okonkwo makes his biggest mistake, and Igbo culture is partly responsible because Igbo culture makes a lot of strength and power and success and Okonkwo heard this from his society. He heard it all the time, you know, this importance of strength and being manly and so on. Now Igbo society does not talk so loudly about the other side, but it talks gently. It’s there, but you’ve got to make an effort to listen to hear it. If you are wearing all these heavy things people wear in their ears nowadays, you probably won’t hear it. But in a gentle voice the society is saying, “But also remember your children, but also remember the women, but also remember compassion.” Why does it say, “Well if the gods have decided that this boy (Ikemefuna] should die, we can’t stop them but I won’t be there”? So cowardice is even a value. The Igbo society is saying that to Okonkwo. It is not only in the machete that there is virtue. There is virtue in sitting down quietly and contemplating. Unoka is something of a poet in a sense, certainly in his use of language. He is also a dramatist in the way he dismisses Okoye, his creditor. And there is something of a philosopher in him as well. In a sense, you’ve created an artist figure in him, a man who in a different time and society would sit down and write witty and interesting books—and be successful. But he lived in a society that required that, in addition to being a good artist, being good at your flute and music, you must also be a good farmer and brave warrior. Did you deliberately want Unoka to be that artist figure within this society, maybe a wise man, but wise in his own wretched way? Obviously, yes. I mean that’s why he’s there, I guess. The way I write is not to say, “Okay, where is an artist figure to put in here?” The story dictates all that. Even what we call it, which is a way of defining in a precise way what is perhaps loose and vague and so on, about a character—all that is part of your story, your story-making. And I think one learns how to include them without even talking about them as if they were abstractions. This is what you find in a complete life, the life of a society that is truly alive. TFA has become the most widely read, most widely translated novel in African literature. Have you reflected at all on the impact that TFA specifically but also your total oeuvre have had on other African writers? Yes. I haven’t given much thought in the sense of writing anything about it. For one thing, it’s a little risky, you know. Some people started talking about the Achebe generation. It’s not everybody who wants to be in the school of Achebe. So it wasn’t even the younger generation. These were people of my own age. And many of them, quite a number, did take up writing, but of course they would write differently. And by the way, the generation of Cyprian Ekwensi was then the background, the older generation than ourselves. He had followed a different path in writing, but he was there. So it wasn’t altogether an accident. Amos Tutuola was there; again a different path. Some pundits said, “Oh that’s how African literature will be,” but no single person has ever copied Tutuola because there is just no way you can get it. That is his own. So we are lucky. There is really talent in our culture, a lot of talent, and it’s not an accident that Nigeria, in the past, has all these traditions – the Nok culture, the Igbo-Ukwu culture, the Ife culture, the Benin culture – and all of them very rich. And all we need is to sit down quietly and make something of it. TFA and Okonkwo have been with us for 50 years. Has Okonkwo been living with you these 50 years, has he been with you, and how is he doing? Yeah, it’s interesting how you put it. He has, and what I feel towards him is a sense of wonder and pity. Pity is probably not a good word because Okonkwo is a very dignified and proud person and would not like anyone to pity him. But I am sort of concerned that a major aspect of our human experience has to be suffering and failing to reach where you set out to go because of all kinds of things on the way. One day somebody came to me in the hospital after I had this accident, and the question he asked me was, “Why you? Why would this happen to you?” So I said—I didn’t think twice—I said to him, “Do you have an idea of somebody else to whom it should have happened?” What I was saying is that the world is tragic by nature. And that’s why tragic stories appeal to me, far more than happy and comic stories. Both the tragic and the comic are there in our lives, but somehow the tragic one, the Okonkwo kind of story, is the one that speaks most to us. 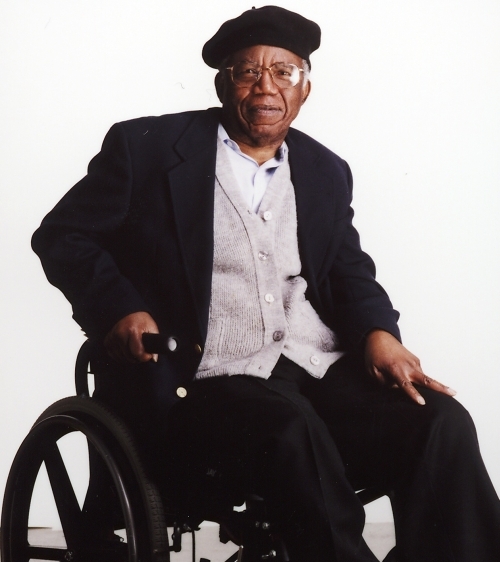 You’ve made a personal effort to make sure we don’t forget the late poet, Christopher Okigbo, who was your close friend. Does Okigbo live on because of your efforts or because he left behind works that still speak to us? My son was two years or three years old when Okigbo died, and when I came back – this is during the Biafran war – I just traveled from Enugu to my home to announce to my family that I heard on the radio that Okigbo had been killed. My son, Ike, said, “Daddy, don’t let him die!” The reason was that Okigbo had made friends with him. Okigbo had friends everywhere, children, old people. I remember that whenever he came to visit us, this little boy would hold his hand and try to break it and Okigbo would be pretending to be in pain crying. They would be struggling this way and Okigbo would say over his head, “Children are so wicked.” And so that’s the boy who said, “Don’t let him die.” I then decided to publish something called Don’t Let Him Die, an anthology of poetry by friends of Okigbo—or anyone who wanted to contribute. There was no plan which would work unless the subject, in this case Okigbo, had something of interest to say. His life was so romantic in a way, his life and death was so extraordinary. It just seemed so unlike anybody else you knew. So that’s the material for the kind of history that we have of him. But there is also the profound nature of his poetry. So it is both his life and his works. There’s the moment in TFA when the District Commissioner says the story of Okonkwo is interesting, but he wants to give it perhaps a paragraph in his own book. Did you consciously write that as irony…? Yeah, I think so. I mean it’s clearly…it’s not very fine irony, it’s so crude. _Yeah, for the man who said it. But that’s how they figured out the colonial subject. I read your bio and you were a very savvy young man, the way they described you in those days in the 70s, the way you dressed, and all that. When I heard of this accident, it’s been worrying me, and I’m sure it’s worried a lot of your fans: What exactly has this accident meant to you as a writer and person? Do you think you could have produced more than you’ve done…? Well, it’s done those things you’ve just indicated. I was telling you the story of the fellow who said, Why should it happen to me? And my answer is “Why not?” And that’s really what I believe. Look at my fiction. Okonkwo is strong-headed, and wouldn’t listen to advice, and it’s a trap. And what happens? He comes to a sticky end. Then I say, okay, let me try a different kind of African, an intellectual kind of person. So I go to Ezeulu in Arrow of God. He is a priest, a philosopher, and what happens to him? He comes to a sticky end. So there’s no way out. What came to us—in Igbo they say that what came to Nte—Nte is a small insect—the Igbo say that what came to it is bigger than it. What was caught in his trap – Nte went and set a trap – and something bigger than himself was caught in that trap. So what does Nte do? So there is no way, there is no short answer to the problem posed to us from the moment the initiative was taken from us and we lost our freedom and independence. How can literature illuminate the African even human crisis? Oh, there were people who had a very, very rough treatment in the world. They are known as black people. And they were fighting or struggling to make sense of what happened to them. Someone said to them, “Why should this happen to you, why you?” And they said, “Well, that’s the way the world is.” We must find a way out, we must face this problem, face our history. When a people have a history that is embittered—Anthills of the Savannah—an embittered history, we’ve got a task on our hands. We’ve got a big task. And even Nigeria, impossible as it seems, we’ll someday get under control. We won’t keep having retired generals and so on much longer. The thing is not to lose hope. Despair is the worst possible suggestion. I think we must struggle and keep fighting. Over the next fifty years, will TFA continue to speak to us about this struggle? Well if it does I mean if you find it useful, but it’s not because I said so it is simply that people found that it was speaking to them. If it stops speaking to people then people will stop reading it. When you were writing TFA, which was the day you felt, yes, this was a book and I trust it? Well, I think it was the day I finished. But you see, the thing with writing, my kind of writing, is that you never really finish. When I thought I had finished, Bisi Onabanjo, with whom I was sharing accommodation in London we both went to the BBC and a friend he knew I had this manuscript, and he said to me, “Why don’t you show it to this?” The man was a BBC producer who was a novelist, Gilbert Phelps. I was very shy, but Bisi kept saying, “Show him.” So after a while I took this manuscript and I told him I was writing. And he looked as writers look if you bring them a manuscript. He wasn’t hostile, but he wasn’t exactly impressive. But he accepted very polite. Then Bisi and I, we went on some British Council tour of three or four days. One day I came back from an outing and there was a message for me that said one Gilbert Phelps called and left his number. So I said, well, if he doesn’t like the book, would he make a phone call? Wouldn’t he wait for me to return? So maybe he likes it. So I would call him. That was the first response I had and to cut a long story short, he liked the book. He recommended his publishers to see it. Meanwhile, his publishers saw it and they were ready to start. I said, “No, the book is not ready.” I had made a mistake in thinking that I could have three generations in one book. And yet it’s not a big book. So it is too thin to carry this weight. That version of TFA had Okonkwo, Okonkwo’s children’s generation, and a third generation so bringing it to today. And now I realized just so suddenly that there are three books. The first part is Okonkwo. So that’s what I’m going to do. And then after that I’ll see what happens. And so I rewrote the book with this emphasis on Okonkwo’s generation, not his son. Eventually I wrote No Longer At Ease, the story of Okonkwo’s son. But what about my father’s generation? That one is still waiting to be done. So, see, there is no quick answer to your question. If it’s working, go on. If it’s not, then try something else. Of all your books, which one got you into the most struggle? I think it’s A Man of the People. One day I came home, I think it was a Sunday actually, I went out and came back – I was then director of broadcasting. My staff, two young fellows from the North who were in charge of the Hausa Programs—they called me and they said, “Soldiers are looking for you. They said they want to see which is stronger, your pen or their gun.” So I picked up the phone and dialed Victor Badejo who was the director general. I said “Victor, what is this story?” He said, “Where are you?” I said, “I’m at home.” He said, “Take Christie and children and leave.” So I took my family, Christie and the two children, got into the car and began to look for somewhere where we could hide. So that was A Man of the People. That was the closest. Would you ever return to Nigeria? If yes, under what conditions? Well, the conditions, I don’t really ask very much. What I would like to see is a situation in which if I wanted to buy an antibiotic or something, and I went to the pharmacy, it would be an antibiotic that you buy. And that all the doctors we train will not be leaving Nigeria and practicing in America and Britain and so on, but some would stay in Nigeria. Including my son, his whole class in medical school is here the entire class—there is not one in Nigeria. If it were possible to return to life again, in what form would you want to return? The same. [Laughter]. This is the one I know. What do you think about Fela who had almost the same impact in terms of music as you’ve had in literature? You know, he once said I was the only genuine professor. [Laughter]. Well I thought very highly of him. It’s a pity his life was so rough that he just couldn’t survive. But he delivered the message he came to deliver with his music. Like Okigbo, it wasn’t that he didn’t know that what he was going to do was very dangerous. He knew, and tried very hard this is very interesting for me to deceive me about where he was going. He told me he was going to Europe, because we were working together on publishing. If he had told me he was going to join the army, I would have said, “Well, have you thought about it, and what about our publishing?” So he told me he was going to Europe, and it was later I heard. By then he was already in uniform. I am not saying I would stop anybody from what they want to do, but I would say let’s discuss it. You have people who influenced you in literature you’ve talked about Yeats’ poem. Who influenced you in your town of Ogidi? Who was the one trusted adult, or uncle, or friend you confided in? Or asked questions? When last did you read TFA, and did it surprise you in any way? Did you learn something from reading it? A: I haven’t read it all that lately. What I’m doing now is not reading it really; it’s translating, which takes the joy out of reading. But when I dipped into it I dip into it I feel it’s all right. I think it said what it wants to say. If I make up my mind that I want to change it or to edit it, of course you would find something to do. You can change is to was. (Laughter). But it’s not in that caliber now. If there is any spelling mistake, it can stay. (Laughter).